A Lake Minnetonka home improvement project that’s often overlooked or not given enough attention is landscaping a brand new home. 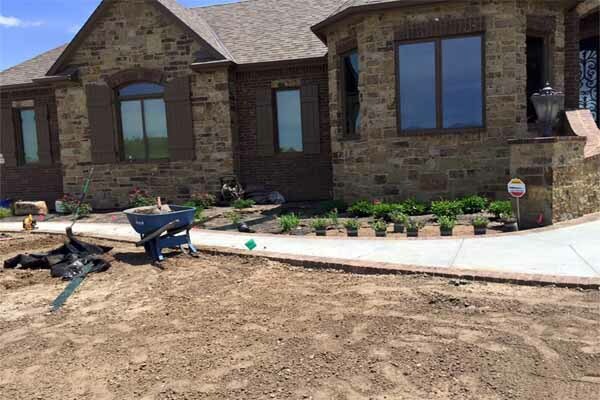 Maybe because you spent so much time, energy and money tending to every little detail finishing a new home requires, when it comes to landscaping many homeowners run out of steam. Ask yourself this question, “How many recently constructed homes have you seen where the landscaping leaves a lot to be desired?” Let’s take a look at a few helpful ideas that will help your new home’s curb appeal – without wrecking your budget. So you’ve seen the light. You don’t want your brand new home to look like it was built on a desert wasteland. You’re excited to get started on your first Lake Minnetonka home improvement project. Now, where to start? If your home was custom built you may have slightly different challenges than if you bought a home in an established neighborhood of newly-constructed homes. Either way, your landscaping needs help. Follow these suggestions to either create or improve your new home’s surroundings. Most of your “lawn” is probably just plain, old dirt. Sure, it looks rich and fertile… after all, just take a look at those luscious green weeds growing wild. If you don’t remember anything else from this article, remember this: take our advice and make sure the soil you’re going to be planting your shrubbery, flowers and grass in is actually topsoil from a reputable source. Replacing existing fill dirt with topsoil will ensure that your lawn and planting beds will have a chance to grow and thrive – whether you have a green thumb or not. After you’ve decided where you’d like the planting beds to be, mark them off using whichever method is easiest for you. Many Lake Minnetonka home improvement experts recommend using a garden hoe to create a small, visible trench 3-4 inches deep around the planting beds. If you plan to sod your lawn, you can use the first few dozen pieces of sod to more closely define the planting bed boundaries. Be creative, don’t make the planting beds square or rectangular, take a page out of the professional landscape designer’s book and make them loose and flowing, serpentine with more rounded borders. You’ll find mowing the grass and edging around the beds will be easier by following that suggestion. Before you move too quickly, take a step back and envision what types of plantings you’d like and where they might look best. This is especially important for seasonal items like certain flowers, flowering shrubs, or even a small vegetable garden. Does the spot you’re considering planting receive lots of direct sunlight? Does it drain well? Anticipating what will grow best in the places you choose will make it easier when it comes time to plant. The plants and shrubs your builder may have planted up against your house may appear unimportant now, but they could be a giant headache later. Lake Minnetonka home improvement experts say you should properly identify any existing plants or shrubs to determine if they’re good choices for your landscaping. If you don’t like it or don’t want it where it is, dig it up and either relocate it or get rid of it. Do it while the roots are still young and haven’t taken hold – it will be easier now than later. Do the same with any undesirable or unattractive trees that may have been planted. A tree with an abundance of leaves, flowers or fruit may create extra yard work, clog gutters and downspouts and stain your home, walkway or driveway. Some plants and smaller trees may seem perfectly fine for now, but if they grow to be too large for their space or if they were planted too close to the house, they could become problems later. Take special care for some trees that may be planted adjacent to sidewalks, walkways or driveways. As they mature the tree roots may spread under the concrete or paved areas, causing cracks or raised areas that may be difficult and expensive to repair. If you’re considering doing some backyard landscaping for entertaining family and friends, consider this tip. Write down your biggest priority and what the focal point of the backyard will be. Chances are, if you have a patio or deck most of the entertaining will be focused there. Plan any future entertainment or other backyard additions as you envision your lifestyle changing and growing. Perhaps the makeshift sandbox will be replaced with a sturdy new swing-set as the kids get older. Maybe one day you’ll replace that gas grill you’ve had forever with a built-in version as you expand the deck. Wait… where are you going to put the swimming pool? The possibilities are endless, but chances are your lot lines aren’t – so be smart, plan ahead as best you can. It will save headaches and money in the long run. It could be the most important Lake Minnetonka home improvement landscaping tip of all – be sure everything you’re planning to plant gets enough water. Whether you’re going to seed your lawn or sod it, plant your own shrubs and flowers or hire a professional, it sounds silly but nothing will grow properly without water. Decide ahead of time if you’ll install an irrigation system. It’s usually a job that’s best done by professional irrigation installers with the proper equipment and tools. However, with some planning, a rented trench digger, proper PVC pipe, glue, sprinkler heads and an ample supply of time and patience, it can be a relatively easy Lake Minnetonka home improvement project to undertake yourself. Another word of advice, leave the actual drilling for the water source from underground wells and the installation of the pump system to the pros. You’ll be much happier afterward. Now that you have a game plan it’s time to spring into action. Your all-new outdoor landscape will be the perfect complement to your brand new home. Oh, and don’t forget to go buy a lawnmower, edger, rake, weed eater and a dozen other gardening tools you’ll need! Read more about home improvements in the section of articles on Lake Minnetonka Home Improvements just below Lake Minnetonka Real Estate Categories in the column to your right. Remember, we also post tips daily on Facebook and Twitter. Check us out there, too. « Lake Minnetonka Mortgage News – Time to Refinance?